Minor Edition sell the most beautiful, unique & stylish dresses for girls aged 2-6 years; we were very lucky to have one sent for Boo to review. 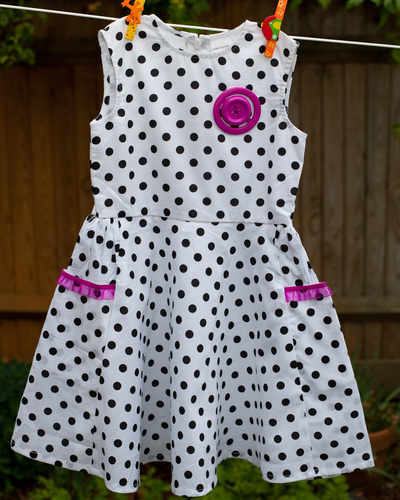 A very retro look with bright pink button and cute trim on the side pocket, this is a little girls dream dress. Perfect with black or even better, bright pink shoes. A bright pink bolero will be perfect with it, on those windy days. Preferably hand wash or dry-clean. Boo always loves to get a new dress! I can see a very expensive future ahead with lots of designer dresses, shoes and handbags! She was over the moon when she opened this which Ipshita had kindly wrapped and sent for her birthday :O) She had a birthday party to go to that afternoon – I’ll give you one guess what she wore ;O) The lovely comments we received at the birthday party confirmed how adorable she looked and that it really is a very unique dress! 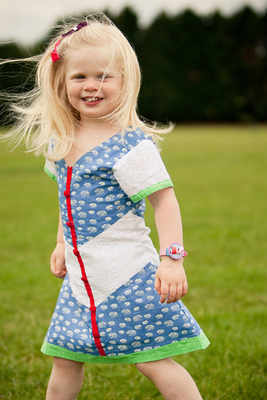 It is beautifully made, I just love the style, the button and the pink trim! I wouldn’t hesitate to buy from Minor Edition or to recommend them to all my friends! Absolutely GORGEOUS!! Here are a couple more of the dresses that they do! 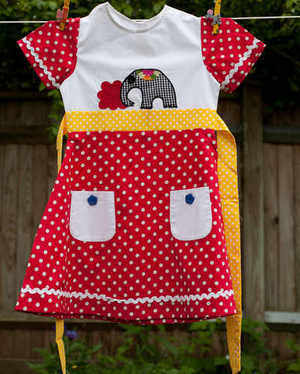 These will make a perfect gift for a special little girl this Christmas!